Please see above for more photos. 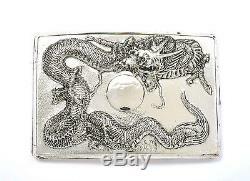 Early 20th Century Chinese or Japanese Gilded Interior Silver Cigarette Case with Dragon Marked "Silver". 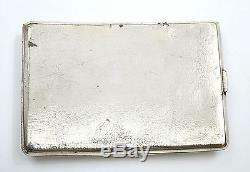 It is 2.95 inches (7.5 cm) long by 4.5 inches (11.5 cm) wide. It is 134.1 gram. 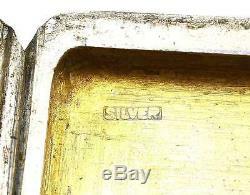 It has rubbing of gold, surfaces scratches, tarnished, small dents, cut marks, and a hairline crack (as seen in the photos). So, please scroll all the way down to look for additional information and photos posted. The item "Early 20C Chinese Japanese Gilt Sterling Silver Cigarette Box Case Dragon 134g" is in sale since Saturday, January 14, 2017.